DONETSK, Ukraine -- Government troops pressed attacks Tuesday in the two largest cities held by pro-Russian rebels in eastern Ukraine, while Kiev also pursued diplomatic efforts to resolve the conflict that has killed more than 2,000 and displaced another 300,000. 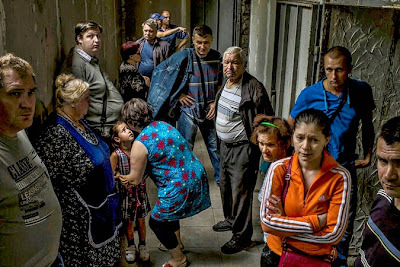 Residents in Eastern Ukraine hiding in a basement shelter. Ukrainian President Petro Poroshenko prepared to host German Chancellor Angela Merkel this weekend before heading to a meeting next week with Russian President Vladimir Putin. The next two weeks "will be crucial for finding the way to move from war to peace," said Valery Chaly, the deputy head of Poroshenko's administration. He said in a televised briefing that Kiev sees "clear diplomatic roadmap" ahead and expressed hope that a new approach could be found to end the war. Poroshenko's efforts to quell the insurgency have been focused on encircling Donetsk, the largest rebel-controlled city and a regional capital. Fighting began in mid-April after Russia annexed Crimea, a peninsula on the Black Sea, while Kiev's forces have recaptured significant amounts of territory from the separatists. Moscow has denied allegations by Kiev and the West that it has fomented the rebellion in the Russian-speaking parts of eastern Ukraine. It says the Ukrainian government has discriminated against residents of the region who seek closer ties to Russia. In fighting Tuesday, one soldier was killed and four were wounded when a pro-Kiev battalion of volunteers came under mortar fire before entering the town of Ilovaysk, 18 kilometers (11 miles) east of Donetsk, Ukrainian officials said. Among the wounded in Ilovaysk was the commander of the Donbass battalion, Semyon Semenchenko, who said his forces had destroyed three rebel checkpoints and four firing positions and that fighting continued. Semenchenko, who appears in public in his trademark balaclava, has cult hero status in Ukraine for his battlefield exploits. Ukrainian troops also captured a neighborhood in the regional capital of Luhansk, battling rebels on the city's streets, National Security Council spokesman Colonel Andriy Lysenko said. The fighting has killed at least 2,086 people as of Aug. 10, and it has forced nearly 344,000 to flee their homes, according to the United Nations. Living conditions in rebel-held cities had deteriorated rapidly in recent weeks. With the rebels losing more and more ground, the Kremlin announced a summit will be held in Minsk, Belarus, on Aug. 26 that would also include top officials from Ukraine, the European Commission and the Customs Union bloc, which is made up of Russia, Kazakhstan, and Belarus. Putin and Poroshenko have not met since early June. Poroshenko, who confirmed the meeting, said "stabilizing the situation" in eastern Ukraine would be a key topic of discussion. Putin spokesman Dmitry Peskov said, however, that the Russian leader wanted to talk about the deteriorating humanitarian situation there. But first, Poroshenko will meet Saturday in Kiev with Merkel. Germany, Europe's largest economy with close business ties with Moscow, has played a leading role in trying to defuse the crisis. The conflict has recently taken a huge toll on Luhansk, a city near the Russian border that has been left without electricity, running water or phone service for 17 days. Central Luhansk came under fierce shelling overnight, killing and wounding civilians, the city administration said, without giving specific casualty figures. Residents were reported to be standing in lines to buy bread. Authorities also expressed fears about the possible outbreak of infectious diseases from mounting piles of garbage that have been uncollected for more than two weeks. Artillery fire also was heard across Donetsk, with areas on the outskirts hit hardest city, authorities said. A resident of Olenivka, a village south of Donetsk, told The Associated Press by phone that Ukrainian government troops were firing artillery from fields near her house. The woman, who asked to be identified only as Tatyana because she feared reprisal from the troops, said houses in her village had been hit by return fire in previous days. Loud blasts could be heard in the background as she spoke. The eyewitness accounts appeared to dispute statements from the Kiev government that armed forces have refrained from aiming rockets at residential areas. The Defense Ministry in Kiev released a video purporting to show that rebels killed dozens of civilians in a shelling attack Monday on a convoy of refugees fleeing Luhansk. The rebels denied any attack took place, while the U.S. confirmed that the convoy was hit but said it did not know who was responsible. The video showed people who reportedly survived the attack speaking in the village of Novosvitlovka. A young man was shown sobbing in a hospital bed. A woman who was not seen on camera said the man's mother was killed in the attack. The video, which was posted online, could not be independently verified. Ukraine and the West have voiced concerns about Russia's military activity near the border. Moscow has invited a mission from the Organization for Security and Cooperation in Europe to observe two border crossings to try to counter allegations that Russia is supplying the rebels with weapons. Paul Picard, head of that OSCE mission, told reporters in a Russian border town that observers had seen a marked increase in military activity around the border points over the past week. Tensions have been high since Russia announced plans last week to send an aid convoy of more than 200 trucks to help alleviate the unfolding humanitarian crisis in the east. The International Committee of the Red Cross, which is expected to take responsibility for the convoy when it enters Ukraine, was still awaiting security guarantees from all sides. Russia's Foreign Ministry said both Moscow and the rebels have provided security guarantees for the convoy — unlike Kiev. Ukrainian Foreign Ministry spokesman Evhen Perebiynis said Kiev could not guarantee its safety on rebel territory because it does not control the area. Russia has chosen to try to send its convoy through a rebel-held border post, against Ukraine's wishes. Also Tuesday, Malaysian Defense Minister Hishammuddin Hussein said the first remains of Malaysians who were killed when a jetliner was shot down over Ukraine will be flown home this week. All 298 people on board died when Malaysia Airlines Flight 17 was shot down July 17 over the rebel-held area in the Donetsk region.